Moto X4 becomes the second Android One device today to receive the stable Android 9.0 Pie update followed by Motorola Power One. 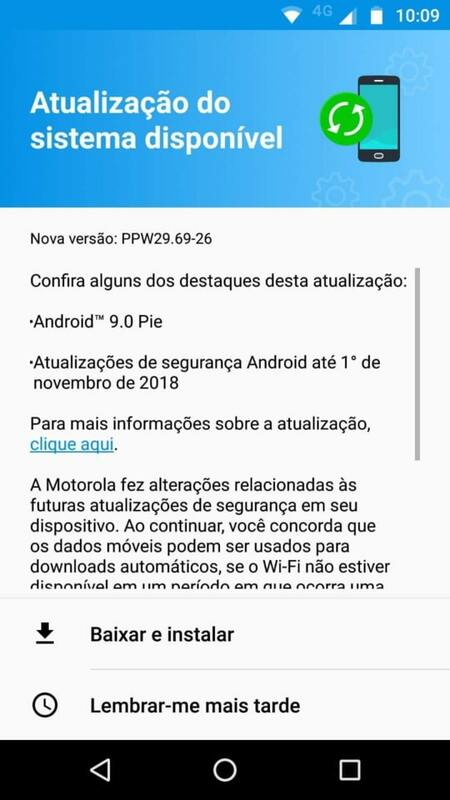 The manufacturer is now rolling out official Android 9.0 Pie (not soak test) for the Moto X4 with firmware build number PPW29.69-26. The OTA also features the newest November 2018 security patch and all the Android 9.0 goodies. The soak test for Moto X4 and some users are now receiving the stable build over-the-air for the Android One variant. The OTA is currently live in the regions of Brazil and will soon be available across the globe. The good news is, users of Moto X4 have managed to capture the Android Pie OTA update zip so you don’t have to wait anymore. You will find various OTA update links from various version of Moto X4 software; right from Android 8.0 Oreo to 8.1 Oreo and finally up to 9.0 Pie. We will soon add the full stock firmware downloads here. So stay tuned. Not much is know or listed in the update log below. However, we are certain it features all the latest 9.0 Pie goodies from Google’s Android One project. In order to download the Android 9.0 Pie OTA update, you can go to Settings > About Phone > System Updates > and check for any OTA notification. If you have it then you can capture it using this tutorial – capture the OTA update before you apply. Here we have the latest Android 9.0 Pie OTA update available for download for the Moto X4 from below. The following has been tested working on Moto X4 variants listed below. Note that the Android 9 Pie OTA update zip won’t work on Android One (google_fi) or Amazon (AMZ) variants. It only works on Retail phones. If you are on custom ROMS, do flash the factory images before heading over to flashing the Android 9 Pie OTA updates. You may also need this flash-all batch file. For those of you who are on the Android 8.1 Oreo OTA update based on September 2018 security patch with build number OPWS28.3.3, can update in the following order. How to Update Moto X4 to Android 9.0 Pie? Restart into the recovery mode. The update is slow and might as well take upto an 1 hour to complete. So kkp your device fully charged prior. You can update it using the stock recovery method (ADB sideload OTA update) or the Motorola Update Service method listed for the Motorola Power One device post.